On a recent morning, as Waikiki was waking up, Daniel Martinez slid up to the bar at Legends Sports Pub on Nahua Street, ordered an Irish coffee, bummed a smoke from a neighbor and proceeded to engage in his personal religion. "Some people are Christian, some people are Muslim; I follow football," he said, employing the international moniker for what people in the United States call soccer. For soccer followers like Martinez, the sport's highest holiday is approaching. The national teams of France and Italy are preparing to battle on Sunday for the World Cup trophy, the sport's highest prize. And for Martinez, a barber who lives in Makiki, there's only one place to watch the game. "Back home I'm always going to soccer pubs," said Martinez, who is from Queens, N.Y. "Here, this is the closest I can find." In a tourist mecca better known for surf shops, souvenir stands and designer boutiques, Legends Sports Pub in Waikiki has carved out an unlikely niche: serving soccer fanatics in Hawaii -- both those who live here and fans who find themselves far from home, jonesing to watch what the Brazilians call "the beautiful game." Kim May, the manager of Legends, says the bar has no choice but to open up for the World Cup games, even if the match times, which fall early in the morning in Hawaii, aren't prime time for slamming brewskies. 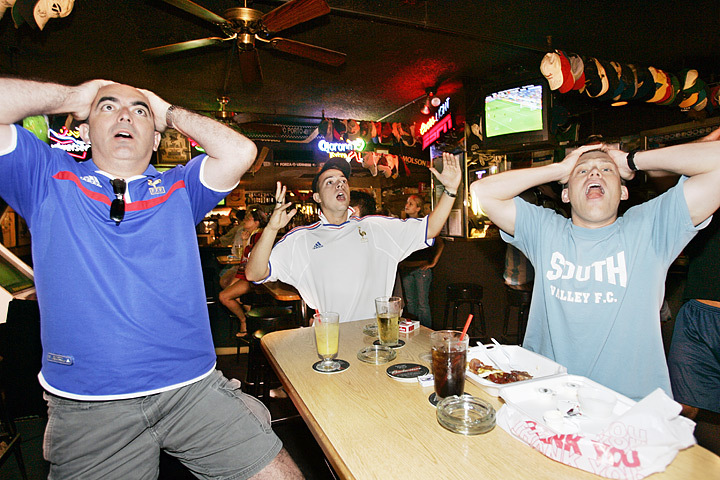 Legends' status as Oahu's unofficial soccer headquarters makes showing the games a must. "It's something we have to give our regulars," she said. "Not to show it would not be good for us." To be sure, Legends is not the only bar or restaurant in town where people can catch the games. The Walt Disney Co. has broadcast all the World Cup matches, on either its ESPN or ABC networks, and will broadcast the final as well. That means easy access to the matches. But Legends has not established its reputation by merely showing soccer games that can be caught on simple cable television. What makes the tiny hole-in-the-wall bar unusual, if not unique in Hawaii, is that it shows elite European professional league matches, brought in via satellite. Legends is so committed to soccer that it posts schedules of what games will be shown and even e-mails information to regulars, May said. That means Martinez can follow his favorite team, North London's Arsenal, of the English Premier League, while May can follow hers, Manchester United. How exactly Legends finds access to the games and the schedules of when they will be played is a trade secret. May, who is the bar's designated spokeswoman, also won't say how much the games cost to access. She will say, however, that the numbers work. "Businesswise, it has to work out or we wouldn't be showing it," May said. Regardless of whether the World Cup proves a profitable event or merely a gesture of gratitude for regulars, Legends was not hurting for customers early Wednesday. Midway through the France-Portugal semi-final match, the bar was considerably more than half full. And despite the hour -- the game started at 9 a.m. -- drinks were flowing. "It's not early; it's 7 p.m. in France," said Jeff Marc, a San Francisco-based food-services executive who is originally from Marseille. "It's aperitif time!" Marc said, sipping his second screwdriver as France clung to the 1-0 lead it would hold on to for the rest of the game. The crowd wasn't as big as the one on July 4, when Italy beat Germany to advance to the finals, May said. And she expects the final game on Sunday will draw the biggest crowd so far. But for fans like Martinez, the enthusiasm of his fellow patrons was the key, not the size of the crowd. Although Martinez wore the blue and white striped jersey of the Argentinian national team, he was pulling firmly for France because of his favorite player, France's star striker Thierry Henry, who plays for Arsenal when not serving the French national team. So for Martinez, what counted most were the cheers of the partisan French crowd at the bar who chanted and sang when Les Bleus clinched their spot in the final match. That's what made it worth going to the bar, he said. "You want to go to a place where you can share with people, where you can yell with people," Martinez said.